A video showing six drunken goons beat up a forest official has gone viral with claims that the accused is the son of a politician. BOOM fact checks the claim. 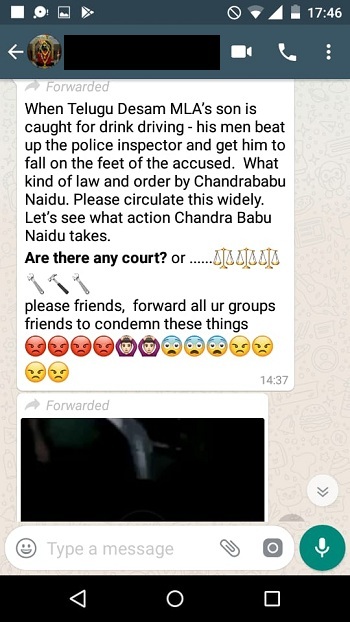 Andhra Pradesh police have filed a case against unknown persons for forwarding a video showing six men assaulting a forest official with misleading text that the son of a local politician beat up a police sub inspector of the state. 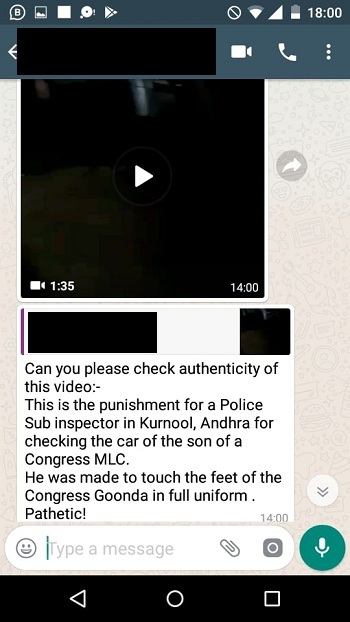 The 1.36 second video is viral on Facebook, Twitter and WhatsApp with various messages claiming one of the accused is the son of a Telugu Desam Party (TDP) MLA while others claiming he is the son of a Congress MLC. Mahesh Hegde, one of the founders of fake news and propaganda website Postcard News also tweeted about the same blaming Congress and tagged Congress President Rahul Gandhi in his tweet. 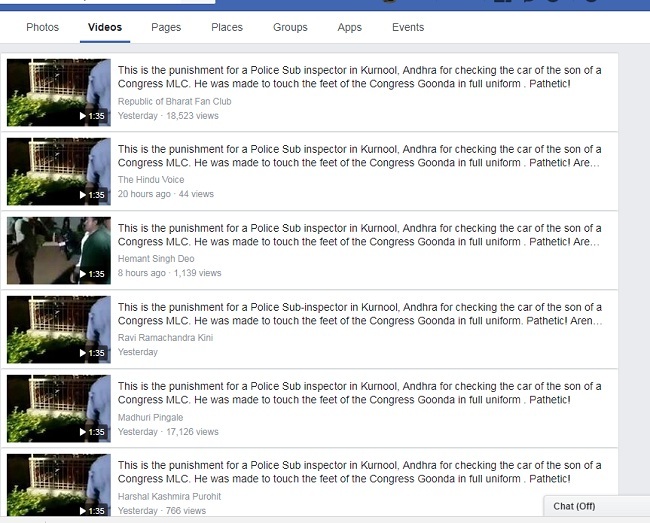 This is the punishment for a Police Sub inspector in Kurnool, Andhra for checking the car of the son of a Congress MLC. He was made to touch the feet of the Congress Goonda in full uniform . Pathetic! Aren’t you ashamed of yourself? Hegde’s tweet was fact checked by Deputy Conservator of Forests, Deepika Bajpai, on Twitter. In the video the six people, who are in an inebriated state, assault the uniformed official for interrupting their booze party. Adding insult to injury, the official is forced to apologise and touch the feet of the accused. 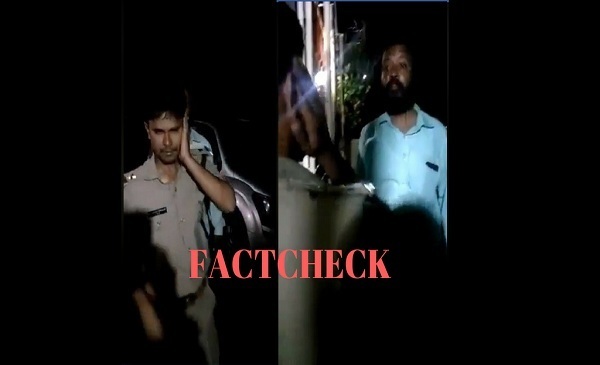 BOOM was able to verify that this video is from Kurnool district of Andhra Pradesh when six men assaulted and humiliated a forest beat officer – Jyothi Swarup – for stopping them from consuming alcohol in a reserved forest area. In the video one of them can be heard pointing to another accused and saying in Telugu, “He is the MLC’s son”, following which the officer is made to touch the feet of one of the accused. The incident that happened on the eve of Independence Day at Sunnipenta in the Nallamalla Tiger Reserve when the six accused were stopped by the forest officer Swarup for drinking in a protected forest area. The six accused have been identified as Raju, Srinivas, Dayanand, Abhinay Reddy, Ashok Kumar and Kausar all hailing from Hyderabad. The accused have been booked under relevant sections of the Indian Penal Code and remanded to judicial custody. 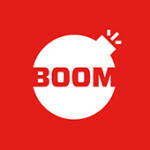 BOOM reached out to the Madhav Reddy, Additional Superintendent of Police, Atmakur Sub-Division, Andhra Pradesh where the incident happened and he explained that none of the accused have political connections. “In the video one of the accused Abhinay Reddy claimed to be the distant relative of former Congress MLC Ranga Reddy from Telangana. He said his (Abhinay’s) father Hanumantha Reddy is the cousin of Ranga Reddy,” the police official told BOOM. The senior officer added that none of the accused or their families are into active politics or working with any political party. “They are all small times businessman and in the video were bragging falsely because they were drunk.” The police official added that they even reached out to Ranga Reddy via their sources to be sure and he too denied having any connection to the said accused or the family. Ranga Reddy was not immediately reachable for a comment. A story by Deccan Chronicle in November 2016 indicated that Ranga Reddy’s term was set to end before MLC polls in Feb-March 2017 in Telangana.